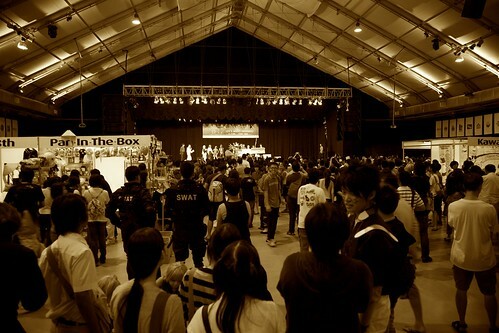 Last weekend, we headed over to Downtown East for Cosfest 2010. 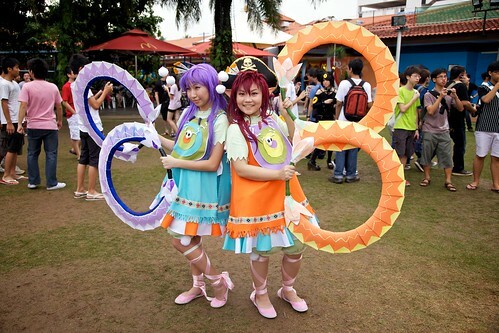 This year marks the 9th anniversary of Singapore’s largest cosplay event. Photos and impressions within. While it certainly is tempting and I do have friends who cosplay, I have never been deeply involved in the cosplay community. My closest personal experiences would probably be the times I celebrated Halloween as a kid. 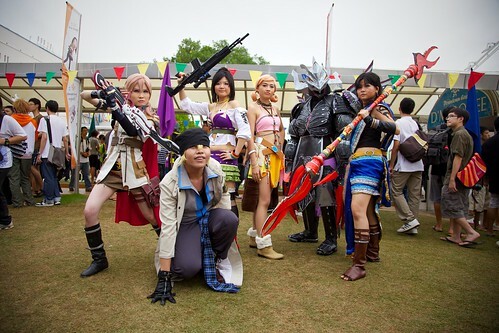 Over the past few years though, I’ve had the chance to attend cosplay events in Japan on multiple occasions. 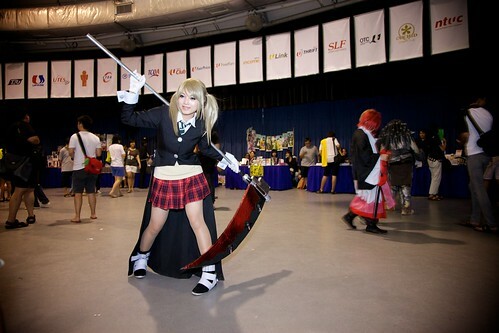 But having never been to a local cosplay event before, I didn’t know quite what to expect. Cosfest was held this year (and last year is seems) over at Downtown East. It’s a budget chalet resort located in Pasir Ris that caters mostly to Singaporean locals. It seemed like hardly the place for such an event. Perhaps I was too optimistic to think that perhaps the organizers planed to make full use of the surrounding parks and beaches as well. Instead, the event took place at a dark tent inside the resort. Hardly the best lighting for photography. Fortunately (or so we believed), we were armed with our own mobile lighting setup. In fact, first up a special thanks to Wilson for letting me use his photos, the ones MJ and I took flopped. Some commercial booths set up at the center of the tent. They had some of the best cosplayers at the event, but drew little attention. There was a Japan travel booth that saw no business, a couple of maids promoting their cafe, a shop selling Kamen Rider dolls and a another selling Goth Loli themed Dollfies. Rows of “Doujinshi” booths were also placed against all the walls. I didn’t spot any original mangas but they sold a variety of homemade fan goods like fan art prints and badges. Still, it was promising to the enthusiasm in the locals to promote such a direction. 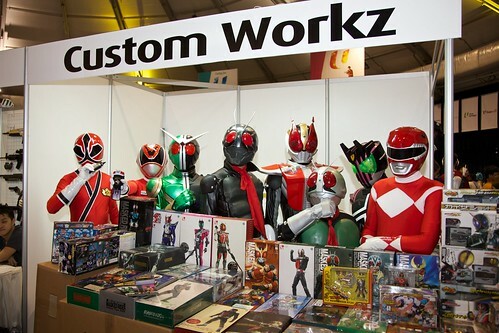 Since the only possible place to take photos in an organized manner were taken up by the booths, cosplayers, cameramen and the general public bounced around randomly within the small tent. It was impossible to get any shot without a background of random people. 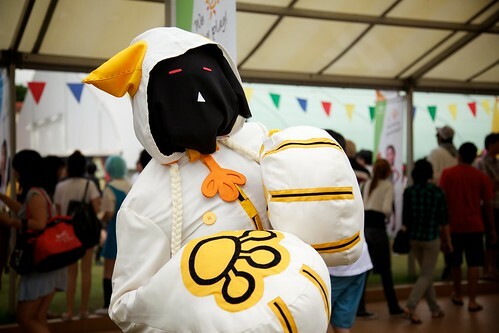 The cosplay culture here in this local event came as quite the shock and I was thoroughly disgusting by the etiquette (or rather lack of) of the people taking photos. It is already well known locally that any photographic opportunities attract some of the most unwanted crowds. I would refrain from calling the hordes of creepy uncles wielding chunky DSLRs, photographers, since they were anything but. Purchasing the most expensive new equipment and taking macro shots of everything doesn’t mean anything when you can’t understand basic manners. This crowd would circle their prey like vultures awaiting their chance, occasionally sneaking candid shots of their targets. When familiar cosplayers collided, the cameramen would start to congregate. Should the cosplayers stop to take photos of each other, these uncles would take the opportunity to snap shots too. You can only imagine the chaos, considering the cameramen outnumbered the cosplayers 1:20. Forget QC, as a cosplayer, you would have no control over who snapped your photos or what deviant purpose they did it for. Also at a most basic level, the cosplayers had a hard time figuring out which camera to look at. The horrible situation is bound to put off first time participants from continuing the pursuit of their hobby. MJ and I went about asking cosplayers if we could take their photos. They were all friendly and more than happy to comply. It was mind blowing that there were actually many onlookers who looked at us with a combination of confusion and disgust that we were actually asking for permission. Apparently, our lighting setup drew quite a bit of attention but I was trying to mentally filter out the hordes. The task seemed impossible though, for whenever a cosplayer posed for us, dozens of other photographs would appear by our sides (or in front!) to snap up shots too, getting their expensive telephoto lenses into my frame or screwing up the lighting with their kit flashes. After some time, we even gathered our own fanclub of creepy uncles who actually followed us around awaiting for us to set up our shots only to jump in and block us off. Demoralized by our folly and irritated by ungraceful scenario, we soon gave up all hope. We were ill prepared for this situation. Since MJ was too lazy to bring his own telephoto, I was stuck shooting with his 50mm prime so we needed a good 4 meters of shooting space. It was difficult communicating with MJ on placing the lights as the noise drown out all attempts. On hindsight, forgoing the umbrella light and just shooting with my Pen might had given better results. At the far end was a large stage. 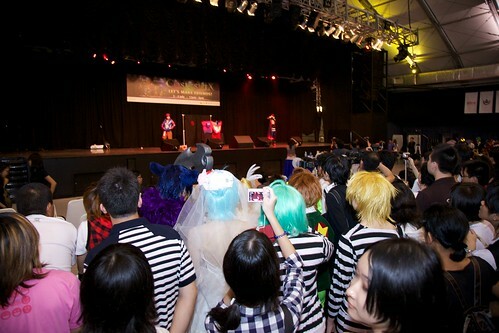 They were holding an anime song singing contest on the first day and cosplay antics on the second. The first couple of groups were some bands that put up a decent performance. There was the occasional delusional singing, as well as a completely off key Vocaloid singer that left the crowd speechless. She deserved an award for her sportsmanship though. MJ introduced that one of the Hello Project forum members was performing. By the afternoon, more strange people brandishing cameras arrived and the cosplayers were unable to break out of their human walls. A couple of Black Rock Shooter cosplayers got stuck in the same spot for close to an hour. We returned from a tea break to see them still stuck firmly at the entrance of the hall. Outside, the more organized photographers set up camp against the walls of the tent. More cosplayers hung around outside to escape from the crowds, some went for a break too while awaiting the night’s events while others (who were probably as disturbed us), headed for home. Didn’t spot any cosplayers rolling back their luggage bags, instead many opted to head back in their costumes, I soon found out why. The restrooms at Downtown East were filthy. The poor few who had too elaborate costumes to travel in had to struggle in the shared washing areas outside of the restrooms. The floor was wet and covered in all manner of grime. One of the toilets was flooded with puke. The shortcomings of the event seemed like a mistake on the part of the organizers. However, the single worst problem was definitely the ill-mannered public attending the event. MJ mentioned that the standard of this year’s cosplay had improved. But for every decent attempt, I spotted countless failures. There were the usual girls as bishonen characters and strangely more guys as female characters, which was fine, if they weren’t doing it badly. Still there were a couple that were alarmingly good. There was even a duo that came as the Yazima Beauty Salon! Hats off to them. They lacked a 3rd to play DJ Ozma though. 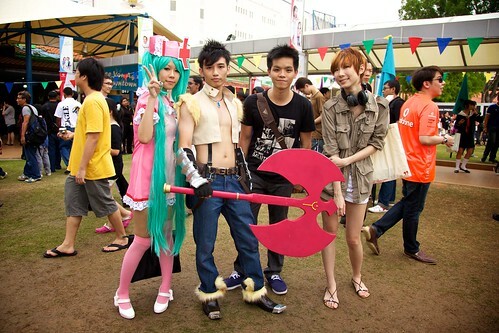 As compared to Japan, the cosplay community here has a far larger male following. And surprisingly, some of the best shows for the day came from guys. We met a buffed 6ft tall Cody and an utterly convincing Jack Sparrow. My only gripe with the standard of cosplay here though was how stiff, most of the cosplayers were. Most of them stuck with only a single pose. When we tried asking the cosplayers to try out different poses, most of them gave us a confused look. It wasn’t totally their fault though as since they were faced with an intimidating wall of endless flashes But the level is still a far cry from the likes of Japan or Korea where they can switch different pose every 3 seconds. While I have been rather taken back by this encounter. I do genuinely hope that the problems with the way things are handled are realized and addressed. Potentially, the community could adapt to become more efficient and professional in the way things are handled. 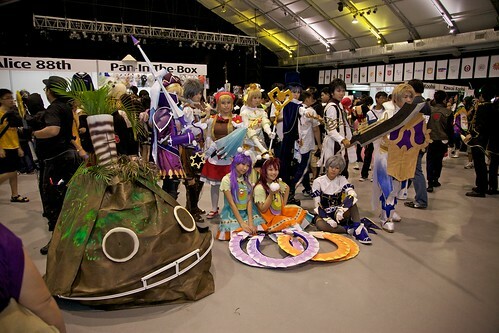 If so, we will see the the level of cosplay here really improve in the future. Maybe I should cosplay as something next year. Credit goes to Wilson for the photographs.